The newsletters (photo copyright Ilan Kelman, 2016). Lewis, J. 1991. "International Hazards Panel", Disasters, vol. 15, no. 3, pp. 296. 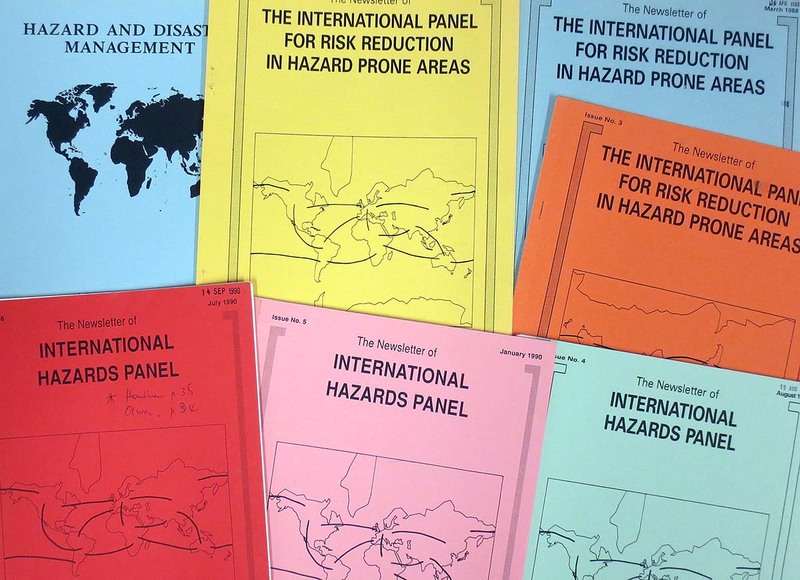 Seven issues of the International Panel for Risk Reduction's (incorporating a change of name in 1989) newsletter represent a powerful contribution to the subject history of what is now widely known as Disaster Risk Reduction. Formed in 1980, the Panel, with 121 members in 29 countries, was one of many offshoots of the then Intermediate Technology Development Group (Practical Action, London). Edited by the Middlesex Polytechnic (University) Flood Hazard Research Centre, seven issues from June 1987 to April 1991 comprise 264 pages and include short and not-so-short articles, recent and forthcoming events and publications, book reviews and project commentaries. The Editorial of Issue No 1 includes the warm invitation to contributors: "Please do not assume everyone will have already heard about an event or will not be interested in the work which you are doing", a reflection of the tenor of the time and a desire to share and to co-operate amongst multidisciplinary members in an amorphous subject. What might appear to some as a buried, bygone and bypassed medium, this resuscitation now achieves new and publicly visible permanency in digital form! Other than transient 'social media' or digital networks, what now provides similar opportunity for short and rapid reports from the field, descriptions of realities, of new research and of new activities? Or has our world changed in 30 years to being more segregated, individualist and competitive? But one change there has not been in that time is that, with few significant exceptions, emphasis remains on disaster aftermath and the cover of resilience, rather than on causes of poverty and vulnerability, and this in spite of the continued emergence of overwhelming supposedly 'new' issues of climate change, mass migrations and social unrest. Issue No. 1. June 1987. "The Newsletter of the International Panel for Risk Reduction in Hazard Prone Areas", full text (6.1 MB in PDF). Issue No. 2. March 1988. "The Newsletter of the International Panel for Risk Reduction in Hazard Prone Areas", full text (3.2 MB in PDF). Issue No. 3. November 1988. "The Newsletter of the International Panel for Risk Reduction in Hazard Prone Areas", full text (4.5 MB in PDF). Issue No. 4. August 1989. "The Newsletter of the International Hazards Panel", full text (2.8 MB in PDF). Issue No. 5. January 1990. "The Newsletter of the International Hazards Panel", full text (3.8 MB in PDF). Issue No. 6. July 1990. "The Newsletter of the International Hazards Panel", full text (3.6 MB in PDF). Issue No. 7. April 1991. "Hazard and Disaster Management", full text (3.1 MB in PDF). -Burton, I. 2001. "The intergovernmental panel on natural disasters (IPND)". Environmental Hazards, vol. 3, no. 3, pp. 139-141. -Doran, R. 2001. "What's in a name? a comment on a possible intergovernmental panel on natural disasters". Environmental Hazards, vol. 3, no. 3, pp. 143. No such panel exists. But it could and it should. The model is the Intergovernmental Panel on Climate Change (IPCC). This panel established jointly by the World Meteorological Organization (WMO) and the United Nations Environment Programme (UNEP) has been extremely successful. A brief review of the reasons for its success provides some grounds for the proposal to establish an Intergovernmental Panel on Natural Disasters, and some suggestions about how it might work. Account is also taken of the contrary views that will certainly be expressed. When the climate change issue emerged onto the international agenda in the late 1980s, some insightful persons foresaw that the potentially catastrophic consequences of unchecked emissions of greenhouse gases would eventually require far reaching international agreements. It was also realised that reaching any sort of agreement would be impossible in the absence of a common understanding of the knowledge base; that is the science, the technology, the economics and other "facts" of the case. The Working Group on Greenhouse Gases (WGGG) was established through the cooperation of WMO, UNEP, and the International Council of Scientific Unions (ICSU). Before long, negotiations were begun to create an international agreement which would eventually be signed at the Rio de Janeiro "Earth Summit" in 1992. As the process of negotiations got underway the diplomatic community, not least those in Foggy Bottom, realised just how fractious the climate change issue could prove to be, and they became wary of letting loose on the problem an independent group of scientists such as those associated with ICSU. Consequently the WGGG was replaced by the IPCC. The IPCC is an intergovernmental body charged with reviewing and assessing the science of climate change in its broadest sense. This includes the atmospheric science and the interactions of the atmosphere with the oceans and the biosphere. It also includes the assessment of what is known about actual and potential impacts, and the social and economic dimensions of the possible adaptation and mitigation responses. Two major assessments have been produced by drawing on the largely pro bono services of more than 2,000 leading scientists nominated by their governments , and the Third Assessment is due to appear later this year (2001). Without the IPCC it is questionable if the United Nations Framework Convention on Climate Change would ever have come into force, and it is most unlikely that the Kyoto Protocol to the Convention would have been agreed to in December 1997. The Protocol has not yet come into force. This will only happen after it has been ratified by at least 55 Parties to the Convention, including developed countries accounting for at least 55% of the total 1990 carbon dioxide emissions. Throughout the negotiations, (and they are expected to continue indefinitely) the IPCC has been looked to as an independent and authoritative source of information. The IPCC assessments are scrupulously careful in avoiding prescriptive judgements. The reports are confined to assessments of what is known, and the degree of confidence that can be ascribed to specific conclusions. The reports also identify knowledge gaps, and thus provide a signpost to the research community. They are widely regarded and accepted as the authority on climate change. There are questions about the true independence of the IPCC since it is an intergovernmental body, and all reports are either adopted (in the case of the Summaries for Policy Makers) or accepted (in the case of the texts of the underlying reports) at intergovernmental meetings. The debates are sometimes very contentious, but they centre on the science, and talk of policies, or actions is excluded. For some schools of post-modern science and philosophy this neutrality of science is a fiction. If so, then it is a very useful fiction and one in which the players seem mostly happy to believe, or to suspend their disbelief. In a very real and positive sense however the idea of neutral science works because the large majority of the scientists themselves intend to be neutral. This kind of scepticism has widespread value to scientists. To be sure, sometimes political positions are cloaked in scientific arguments. Delegates can and sometimes do try to obstruct proceedings in order to make a political point. Ultimately however in IPCC fora the appeal is to the science, and the collective scientific judgement carries the day. How well the process works can be seen by the fact that the judgements of individual and groups of scientists do not conform automatically to the positions that their national governments might wish. Political opinions differ widely about climate change. Some countries (small island states) are outraged and virtually in a panic about sea level rise caused by climate change. At the other extreme, the major oil exporting countries tend to deny that the phenomenon has any reality, or claim that the uncertainties are so great that precipitous action now could be both economically damaging and quite unnecessary. If left to the policy process alone, in which the position of each country was backed by its own selected science, negotiations themselves would scarcely be possible. The existence of the IPCC and the open and effective way in which it has conducted its business, has served to narrow considerably the range of scientific disagreement, to reduce the uncertainty and to narrow the scope of the international negotiations. The claim that the work of the IPCC has been extremely successful, depends somewhat on expectations about the prospects of arriving at binding, effective, and enforceable international agreements. Given the complexities of the climate change issue, the level of uncertainty in the science, and the fact that vital national interests appear to be at stake , it is remarkable that the negotiations have proceeded as far as they have, and that nations continue to exhibit a strong determination to reach agreement sooner or later. All this owes much to the work of the IPCC in formulating its assessments and communicating them to the Conference of the Parties of the Framework Convention. 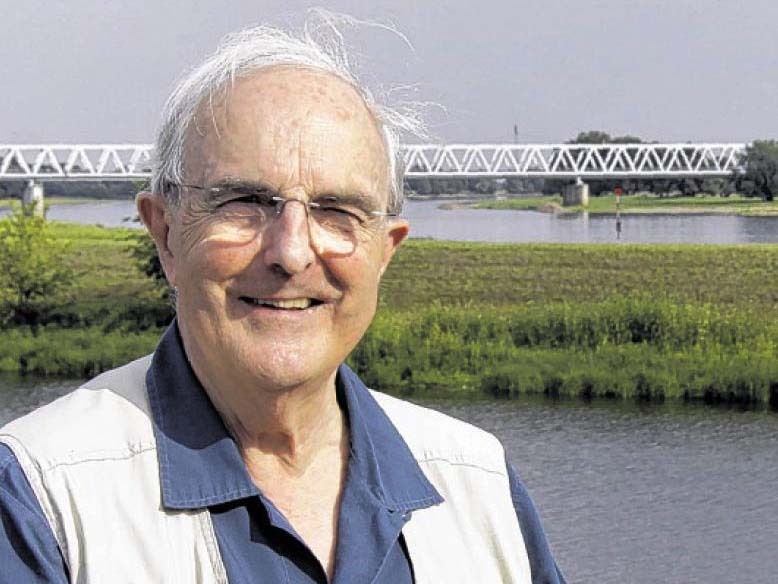 The proposal by Ben Wisner to develop an international treaty that deals with the responsibilities of the nations individually and collectively in the face of the soaring costs of natural disasters is both visionary and practicable. It can be done. It goes without saying that it will not be easy. The most recent international effort to do something more constructive about natural disasters, the International Decade for Natural Disaster Reduction, largely failed. The reasons for the failure have to do with the weaknesses of the United Nations system, and the lack of commitment by many national governments, especially those in developed countries. A fundamental misunderstanding of the problem at the outset of the Decade also contributed to its mediocre performance. It was believed that advancements in scientific understanding of the geophysical processes had reached, or were about to reach, a point at which much improved forecasts and warnings could be issued giving people and governments time to take precautionary action. This proved, as some predicted, to be an overly optimistic view. The timely and precise forecasts and warnings were generally not forthcoming, and even when they were the expectation that precautionary action would significantly reduce losses proved to be a pious hope. The best results have been obtained in the case of atmosphere-related hazards such as tropical cyclones and floods where it has proved possible to reduce the number of lives lost, but not the level of property losses or environmental damage. In the case of earthquakes there has been no equivalent success in the saving of life despite the fact that high earthquake zones are for the most part defined, and building technology is available to prevent collapse in all but the most extreme circumstances. In the developed countries the rising toll of economic losses, insured and uninsured, probably does not significantly exceed the rise in national wealth as measured by GDP. In developing counties the probability is now being recognised that long term recurrent disaster losses may over time exceed the growth in GDP such that economies are setback (sometimes by a decade or more in a few minutes) and that de-development occurs. Such trends are not unknown in the global economy. Trade and currency fluctuations can be a major setback to development, but these risks are well recognised and are under constant surveillance by the IMF, the WTO, and national governments in developed and developing countries. In the view of many informed players and observers, the lessons of the Decade should not be lost and some follow-up action is needed. So far the only action has been the creation of a small Secretariat in Geneva, and the establishment of an inter-agency Task Force, collectively named the International Strategy for Disaster Reduction. So far there is not much sign of a strategy. It promises to be an ineffective palliative "strategy" designed more to placate than to achieve. Ben Wisner is right. There is a need to create an effective international regime to work collectively for the prevention of natural disasters. This might be addressed through the negotiation of a Framework Convention for Natural Disaster Prevention. The experience with the Climate Convention shows that such negotiations would benefit greatly from careful assessments made by an intergovernmental body such as IPCC. Such an assessment would need to consider not only the geophysical science of disasters, but the root causes in social and economic systems which expose so many when the knowledge of how to prevent the worst effects is known and widely available. Both to create momentum and to ensure that any negotiations towards a convention or treaty for disaster prevention are well founded upon existing knowledge a useful step would be the creation of an Intergovernmental Panel on Natural Disasters. Potential parent organisations include the World Bank, UNDP, and WMO (for atmospheric hazards) and UNESCO (for oceans and geological and geophysical hazards). It may be objected that international treaties and conventions are not an effective way of managing such global problems; that there are too many treaties already; or even that disasters are a matter for national governments and that the only international response should be in the realm of immediate emergency relief where a disaster response exceeds that capacity of a government. In response it is being increasingly recognised that humanity is now being drawn closer and closer together by the forces of globalisation. Peoples around the globe have a much more intimate knowledge of each other than ever before. Humanity shares a common future and a common destiny. Part of that is a common responsibility to use the knowledge we have to do what can be done. A good first step would be the establishment of an Intergovernmental Panel on Natural Disasters charged with the task of making an assessment of the present state of knowledge. While I agree very much with the concept, I think the proposed name is too readily linked to a response-centred focus, which in my opinion is not the most pressing need in natural disaster management. In fact, the lethality of disasters has been reduced markedly in the last 30 years--probably due to the attention given to improving emergency preparedness and response capacities around the world. In the 1970s, disasters killed an average of 3.6 people per 100,000 population worldwide. By the year 2000 this had dropped to 1.4. In the same period, the numbers of people affected jumped from 1,918 per 100,000 population to 3,459. To me, this indicates that, while we still have much to do in improving response in disasters, we have made progress but we have made no progress in addressing issues of hazard and in breaking the hazard-disaster link. This alone justifies setting up an Expert body to look at why this is so, since hazard, prevention, and mitigation have been part of the disaster rhetoric for a long time, and presumably there must be some development programmes operated within a disaster management framework (rather than geological, meteorological, hydrological etc.) that have tried to address issues of hazard. Hazards will always be with us, but they don't have to become disasters. If we look at data for 4 of the most measurable hazards for which we have good historical, scientific, and humanitarian data (volcanoes, earthquakes, storms, and floods), we can see that a higher proportion of these hazards are becoming disasters than ever before (e.g. prior to 1970, 0.15% of earthquakes above Richter 4 resulted in a disaster; by 2000 this had risen to 0.3% even though the average number of Richter 4+ earthquakes per year is slightly less now than 100 years ago). Hazards events related to climate change and environmental degradation are occurring in higher numbers per year and a higher proportion of them are causing disasters (slides--mud, land, and snow--seem to be rising particularly dramatically). There is also some evidence that the drip-drip-drip of repeated non-disaster hazard events (mainly flood) in vulnerable communities can be as bad any single-event disaster, and a focus on disaster will miss all the many non-disaster hazard events that cumulatively cause very high levels of economic loss, social disruption, secondary environmental degradation, and morbidity. An Intergovernmental Panel which focuses on Hazards and addresses issues by promoting a risk management approach (combining vulnerability reduction, hazard mitigation/prevention, and emergency preparedness under one programmatic umbrella) would be a very important advance in consolidating scientific, technical, and humanitarian knowledge, and promoting research into the gaps in our knowledge. A hazard approach should accommodate all kinds of hazards--not just natural hazards. Technological hazards contributed to only 18% of events in the 1970s but 41% in the 1990s. I believe there is a growing realisation now that hazards are either natural or anthropogenic but disasters are all anthropogenic. We have to start seeing human behaviour as the cause of disasters and to resolve to change the way we behave and manage our environment. Additionally, hazards addressed through a risk management approach gives disaster management practitioners a comfortable seat at the development table (too often we are seen as peripheral), as risk management has a natural focus on local government, community, sustainability, and consultation for consensus building. A Panel which is seen to focus on cause rather than effect (as the other panels' titles do) will also present a more positive image to policy makers and decision makers. The term Natural Disaster Reduction is a good example of an unfortunate choice of name that did nothing to help the credibility of organisations that adopted it as a tag. International voluntary agreements were reached on disaster risk reduction, namely the Hyogo Framework for Action in 2005 and the Sendai Agreement on Disaster Risk Reduction in 2015. Their effectiveness is debated. Assessments of disaster risk and disasters occur through initiatives such as the World Disasters Report, the World Risk Report, the Global Assessment Report on Disaster Risk Reduction, and the Views from the Frontline programme. The Intergovernmental Panel on Climate Change (IPCC) has come under increasing scientific and policy criticism for multiple reasons, indicating that it might not be a model to emulate. The phrase "natural disaster" is preferably avoided. The need for the panel to be intergovernmental, rather than international and/or independent, has never been fully justified.